Experience the best of Beijing in 7 days. Your Air China arrives in Beijing early morning, so you have the whole day ahead of you. While it's fine to take a quick nap at some point today, get your body clock onto local time as quickly as possible by exercising outdoors. An adventurous walk around the city centre is exactly what you need. In the heart of Beijing lies one of the most glorious relics of its past - Tiananmen Square, which is said to be the largest urban public space in the world. The square is named for the nearby Tiananmen, the Gate of Heavenly Peace, which is the entrance to the Forbidden City. Start by entering Tiananmen Square through the security checks at the designated point (take your passport as you may be asked for ID). Walk across the vast plain of paving stones to find the Monument to the People's Heroes, the Great Hall of the People, the Mausoleum of Mao Zedong and the National Museum. If you get to the square extra early, you can watch the flag raising ceremony. This is held daily at sunrise, or you can try to catch the flag lowering ceremony at sunset. These ceremonies are performed by a troop of the People's Liberation Army who march at a precise 108 steps per minute, 75cm per step. At the north of the square, you'll find the Gate of Heavenly Peace. 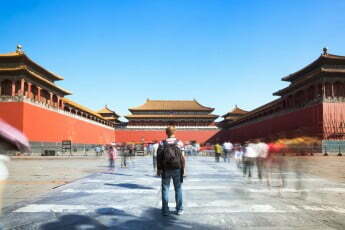 Follow the citadel walls around until you reach the Meridian Gate, then enter the Forbidden City. This palace was built as a home for the emperors (‘sons of heaven’) of China. Such a divine palace was prohibited for mere mortals, which is where the name ‘Forbidden City’ originated. This complex has 9,999 rooms filled with priceless artefacts and treasures. Visit the Three Great Halls, especially the Hall of Supreme Harmony, the largest building in the complex. Inside the hall is an ornate Dragon Throne, which the emperor would occupy during feasts. The next three buildings are similar in configuration, with another three halls. In the Hall of Union, you’ll find a clepsydra. Created in 1745, this water clock is made from five bronze vessels with a calibrated scale. At the far north point of the Forbidden City, a 7000 square metre classical Chinese garden lets you enjoy the sculpted green walkways. Also check out the Treasure Gallery in the north eastern corner. The Imperial concubines lived there in the Ming Dynasty, but today it contains a number of museums. The entrance is near the Clock Exhibition Hall. Once you’ve had your fill of Imperial history, grab a cab or take the subway line 1 to Sanlitun. This food and shopping hub of Beijing is a great spot for a drink and a meal, as well as a bit of people-watching. About 70km northwest of Beijing is Mutianyu, one of the best-preserved parts of the Great Wall of China. 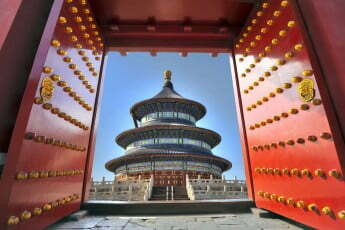 It was first built in the mid-6th century, during the Ming Dynasty. Then in 1404 a pass was built. Finally, in 1569, the wall was rebuilt - and that's what you’re seeing today. You'll need the whole day for this trip, so get up early and grab the 916 express bus with a transfer in the Huairou District. From the ticket office, a shuttle bus will take you to the entrance. Allow an hour to hike up the 4000+ stairs, or take the cable car or chairlift if you wish. 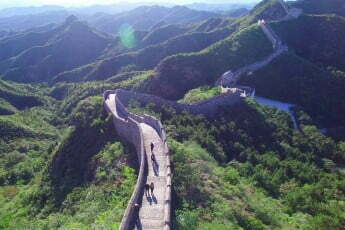 All up, this section of the Great Wall is about 5.5km long and seven to eight metres high, mainly made from granite. It has 23 watchtowers with a variety of architectural details. Both sides of the wall have very rare crenelated parapets. The scenery throughout is beautiful, with forest covering most of the surrounding area. For a thrill, you can steer a luge (toboggan) down the wall, or catch the cable car to save your knees from the downhill trek. There's a restaurant at the foot of the Great Wall. Remember to wear comfortable clothes and shoes. In summer, there is no shade so wear a hat. Bring snacks if you intend to hike the entirety of Mutianyu. After two days of exploring history, spend a day immersing yourself in art at the 798 Art Zone, also known as DAD (Dashanzi Art District). The focus here is contemporary Chinese art in all its shapes and forms, including wall murals, paintings, photography and sculpture. Around the galleries and exhibition spaces there are shops, bars and places to eat that reflect the edgy, uber-cool art environment. In the north-east of the city, you'll find the huge complex of decommissioned military buildings that is now the 798 Art Zone. Over time, it's slowly converted from a military base to the largest collection of art in Beijing. The Bauhaus style factory workshops have morphed into ambitious national and international art installations. Don't miss the 798 Art Factory, with concrete columns littered with Maoist slogans and industrial machines scattered among the art installations. The Xin Dong Cheng space houses avant-garde contemporary Chinese art and 798 Photo Gallery is dedicated to photography unlike anything you've seen before. As you wander through the grounds, you’ll come across open-air sculptures too. For lunch, there are many good restaurants around the 798 Art Zone, with an emphasis on Pan-Asian and European food. We recommend beer and food at 1949 The Hidden City tonight, which has been described as Beijing's hippest food and drink space. In particular, look for the Jing-A Brewing Company American-style IPAs. Traditionally, life in Beijing was centred around water. People built wells, called 'hutongs' in Mongolian, and streets sprung up around these wells. These days, the word 'hutong' refers to the areas of narrow alleyways that capture a slice of history. Admire the traditional homes here, juxtaposed against modern shops and hipster breweries. If you want a break from walking, hire a trishaw to pedal you around the narrow streets or rent your own bike. Close to the hutong area is the Drum Tower. It was built in 1272 and known back then as the 'Tower of Orderly Administration'. In 1924, the name was changed to the 'Tower of Realising Shamefulness'. Today it's simply called the Drum Tower, because it houses drums that were used for time keeping. Near the Drum Tower is the Bell tower, another ancient device for communicating the time of day. Legend says the bell makes a sound similar to the word xie, which means 'shoe' n Chinese. On hearing the bell, mothers would tell their children: "Go to sleep! The Bell Tower is tolling. The goddess who cast the bell wants her embroidered slipper back." Tonight's the night for a duck dinner. Peking (Beijing) duck involves crispy skinned slices of duck, spring onions, refreshing cucumber slices, and sweet and tangy black bean sauce, all wrapped in a soft pancake. Arguably, the best is found at Liqun Roast Duck Restaurant. It first opened in 1902 and your meal will be served in a traditional courtyard. Alternatively try Hua's Restaurant at Guijie Street, only a short wander away from the Great Leap Brewing Company. Built in 1750 for the local royal family to escape the heat of the city, the Summer Palace is a UNESCO World Heritage site. The palace and its grounds are about three square kilometres in size and have a variety of buildings and gardens to investigate. Lapping at the edge of the palace buildings is man-made Kunming Lake, which offers a number of activities for travellers. 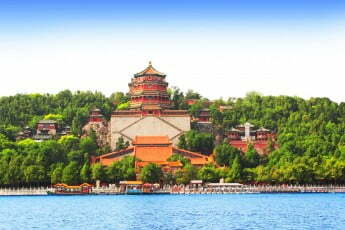 The Summer Palace is in the north west corner of the city and has three major entry gates. Subway line 4 will take you to the north gate. Subway line 10 will get you to the New Palace Gate. The gate you enter will determine your tour route, so choose wisely. Kunming Lake, as we know it today, was created when Emperor Qianlong demanded 100,000 labourers enlarge the existing lake. You can take a ferry across the lake, walk the beautiful 17-Arch Bridge, visit the Marble Boat and the Bronze Ox, or simply walk around the shore perimeter. In winter, the lake freezes over and becomes a massive ice-skating rink! The front area of Longevity Hill houses magnificent buildings. Check out the Hall of Dispelling Clouds, the Tower of Buddhist Incense and the Hall of the Sea of Wisdom. This treasure trove of beautiful and ornate buildings gives you a glimpse into ancient imperial life. The Court Area is where Empress Dowager Cixi and Emperor Guangxu used to meet officials and manage affairs of the state. The Hall of Jade Ripples and the Hall of Joyful Longevity were their living quarters, while the Garden of Virtue and Harmony offers a peaceful space to relax and rest your feet. This is also a good spot to admire the view of Kunming Lake and Longevity Hill. For a traditional hutong dining experience, head to Dali Courtyard where you can sit in the courtyard of a tiny restored home while the food is prepared in the kitchen. The Temple of Heaven is a temple complex where the Emperors of the Ming and Qing dynasties would visit to pray for plentiful harvests. Constructed from 1406 to 1420, It's been extended, renovated, destroyed, robbed, neglected and then restored. In 1918 it was opened as a park, and in 1998 it was officially recognised as a UNESCO World Heritage site. To get there, take the subway and exit at Tiantandongmen Station. Morning is the best time to visit. Local retirees congregate through the east gate and play games, sing and dance - it's a great spectacle and you're welcome to join in. There is also an extensive park around the complex, with a variety of areas to explore. There are three main groups of buildings. The Hall of Prayer for Good Harvests is a building made entirely from wood. Mounted on a marble base, it's 38m tall and the ceiling is supported only with the pillars - no nails or cement! The original was destroyed by lightning in 1889. The Imperial Vault of Heaven is a circular building. It's surrounded by the Echo Wall that can transmit noises over a long distance. Try whispering at one end and seeing if it can be heard at the other (although you may need to time this between tour groups). This vault is connected to the Hall of Prayer by a 360m raised walkway called the Vermillion Steps Bridge. The Circular Mound Altar is a lavishly decorated empty circular platform. It was designed to transmit spoken prayers to heaven, so enjoy the resonance. Dine tonight at TRB (Temple Restaurant Beijing), which overlooks the gate of the Forbidden City and avoids the curse of best-location-worst-food. Impeccable service, European food and vintage wine make this a memorable experience. After five days of walking around monuments and gardens, you deserve to be pampered. What better way to balance your chi than a traditional Chinese massage! Once your legs have recovered, take time to go shopping. Whether you want a small souvenir to take home or a serious antique to send as cargo, Beijing's retail scene will tick all your travel shopping boxes. There are three main styles of massage: a relaxing western-style massage, a massage administered by a blind masseuse, and traditional Chinese massages. In foreign countries, sometimes finding a reputable massage therapist can be tricky, so here's a good rule of thumb: if the receptionist is wearing heels and a miniskirt, try the next place. The blind are said to be able to feel the areas of stress or pain in your body better than sighted people, and there are certainly people who swear by this. A word of warning- you keep your clothes ON throughout the blind massage experience. Ask your hotel for a reputable recommendation. The relaxing massage is much the same as you would get at any western-style therapist. Dragonfly is highly recommended. The traditional Chinese massage incorporates scented oils, and uses pinching and pressing techniques borrowed from acupressure, qigong and reflexology. These massages may not be relaxing, but they will batter your tired muscles into submission. Tang Massage or Suhang Massage offer a well-reviewed service. If it's the weekend, you can head to the Panjiayuan Flea Market for 50,000 square metres of antique shopping. It's a crazy blend of genuine antiques, fakes and tourist tat. Take a 15-minute taxi from the centre of town to southwest of Panjiayuan Bridge. They say the best bargains are found before 8.30am. If this timing doesn't work for you, sift through what's left and you may be rewarded with incredible finds. Liulichange Antiques Street in Hepingmenwai, Xuanwu District is a historical street where poets and scholars used to gather. You can feel the history as you walk the lanes, surrounded by small stores selling ink stones, old books and paintings. 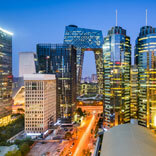 Beijing Curio City is where you'll find the largest antique trading area in Asia. It has over 500 stores selling jade, carvings, paintings and porcelain. Also investigate Xiushui (Silk Street Market) for traders of silk, jewellery, tea and teapots. Yandai Xiejie (Old Pipe Street) near the Drum Tower offers curio and antique shopping in an 800-year-old hutong. Eat vegetarian tonight at King's Joy. The head chef Pan Jianjun is a former disciple of a Jianghxi Buddhist temple. His dishes are inspired by the monk's cuisine and served in a tranquil, elegant garden.